In the fight against TK2 deficiency, you are not alone. Join us, and together we’ll take on TK2 deficiency. Thymidine kinase 2 deficiency, TK2 deficiency (TK2d), is a very rare genetic disease. Tk2d is a form of mitochondrial DNA depletion syndrome. Because the genetic testing that finds TK2d is so new, and there are many other mitochondrial depletion syndromes (MDS) with symptoms like those of TK2d, it is thought that there are many more people with TK2d who have not been diagnosed. Whether you’re living with an MDS, have been diagnosed with TK2d, or are a parent, caregiver, or healthcare professional (HCP) who wants to learn more about MDS and TK2d, join the registry so we can all take on TK2d together. One class of mitochondrial diseases is mtDNA depletion syndromes (MDS or MDDS). Many people have a diagnosis of MDS, but getting a specific genetic diagnosis—like TK2d—is hard. 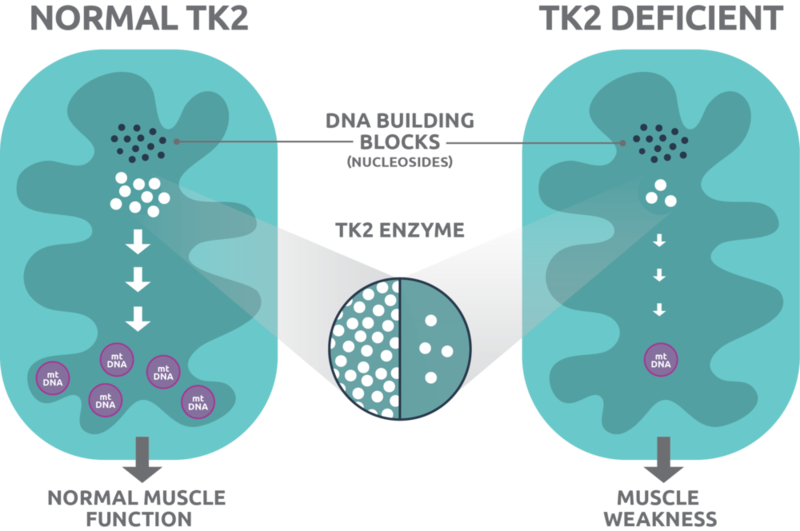 With TK2d, less mtDNA is being made. The result is lower ATP production, which means muscles don’t have enough energy and cannot function right. The more mtDNA depletion you have, the worse your TK2d may be. TK2d is a very rare inherited genetic disease. To have TK2d, both your mother and father must be carriers of mutated (or altered) copies of the TK2 gene and pass those mutated genes to you. This is called autosomal recessive inheritance. There have been many genetic alterations (or changes) found in the TK2 gene that can lead to someone having TK2d. The type of gene a person inherits may or may not predict how severe their TK2d can be and when it may show up. TK2d can either present during infancy/childhood or in adulthood. Around 80% of TK2d patients have onset in childhood. TK2d may start as early as the first year of life through the early teenage years. The infantile/childhood form of TK2d is the most severe and often gets worse very fast. Generally, the earlier in life symptoms start, the quicker symptoms progress. This type represents around 20% of cases. TK2d can also start in the teenage years through adulthood. The first signs might be when you notice it’s hard to do simple tasks (like climbing stairs) or have shortness of breath. Many people, once diagnosed, look back and realize that there were symptoms earlier in their lives that could be explained by having TK2d. Adult-onset TK2d is still severe, but progression is slower and more varied. In general, mitochondrial diseases are hard to diagnose because the symptoms look like those of other conditions. For example, symptoms of spinal muscle atrophy (SMA) are a lot like those of TK2d. Because of this, patients are often misdiagnosed. If a doctor thinks someone may have TK2d, he or she will administer a combination of blood tests, muscle biopsies, and genetic tests to search for a diagnosis. Lab tests look for levels of creatine kinase (CK) and lactic acidosis in the blood. Special attention will be paid to the progression of muscle weakness, elevated serum CK levels, and lactic acidosis. Doctors may also do a muscle biopsy to look at ragged red fibers, check levels of certain enzymes, and measure mtDNA levels. Electromyography (EMG) tests may also be performed to look at muscle function. The only way to confirm a diagnosis of TK2d is through genetic testing. Because we are in the early stages of learning about TK2d, we need to grow our community so we can further all the efforts being made to improve diagnosis and potential treatments for TK2d. Please help us by joining our registry. There are no FDA-approved medicines to treat TK2d. Treatment is focused on managing the symptoms a patient experiences. Your treatment team will include doctors from different specialties. For example, a pulmonologist will help manage lung function and breathing. Physical therapists or rehabilitation specialists will help with muscle function and movement. Your primary doctor will likely be a neurologist or a doctor who specializes in metabolic disorders. There is still much to be learned about living with TK2d. As awareness and knowledge of TK2d increases, our understanding of the disease and the experiences of patients will too. You can help! We want to get to know you and how you take on TK2d. Please join the registry and help us by growing the community and letting our collective experience be the driving force behind change. Join us! Here are links to patient advocacy groups and sites that have information about TK2d. UMDF is dedicated to promoting research and education for the diagnosis, treatment, and cure of mitochondrial disorders and to provide support to affected individuals and families. The MDA is dedicated to transforming the lives of people affected by neuromuscular disease. This nonprofit organization was founded by patients, parents, and Boston hospital healthcare leaders who had a vision of improving quality of life for children and adults with mitochondrial disease. Powerful patient organizations from different countries in the world have joined forces in their fight to be a voice on an international level and find a cure for mitochondrial disease. This site provides resources and information for patients and caregivers about mitochondrial disease, including a list of open studies for patients and a list of participating clinical centers. This resource provides consumer-friendly information about the effects of genetic variation on human health. This site provides information about research, treatment, and patient organizations for mitochondrial myopathies. The MCN represents a group of physicians at medical centers across the country that have expertise and experience in providing coordinated, multidisciplinary care for patients with genetic mitochondrial disease. Here are sites that can help you understand medical terms.